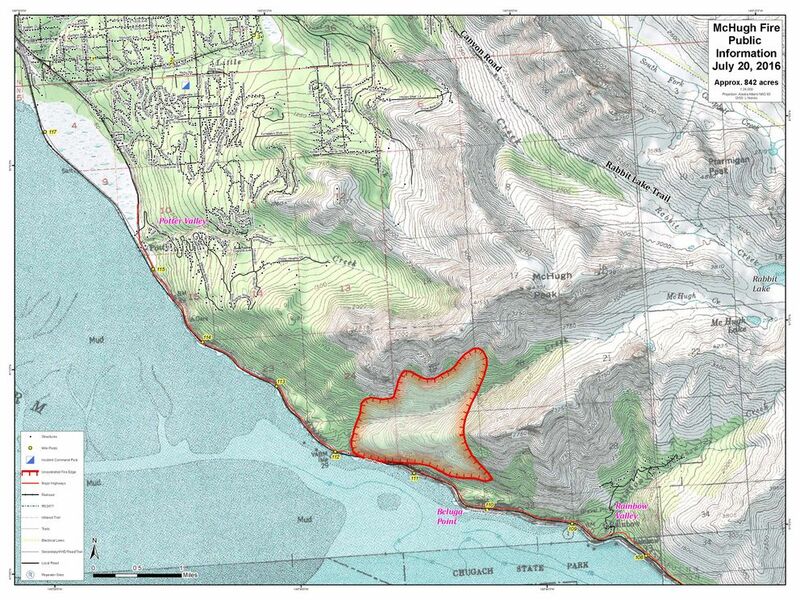 Find Thursday updates on the McHugh Creek fire near Anchorage here. Growth of the McHugh Creek wildfire slowed Wednesday as firefighters worked to contain flames about a mile away from homes in Potter and Rainbow valleys, officials said. The fire was burning an estimated 842 acres in the area by Wednesday evening. The increased acreage — up from an estimate of 350 to 600 acres — was due to better mapping, said a statement from the Alaska Interagency Incident Management Team. 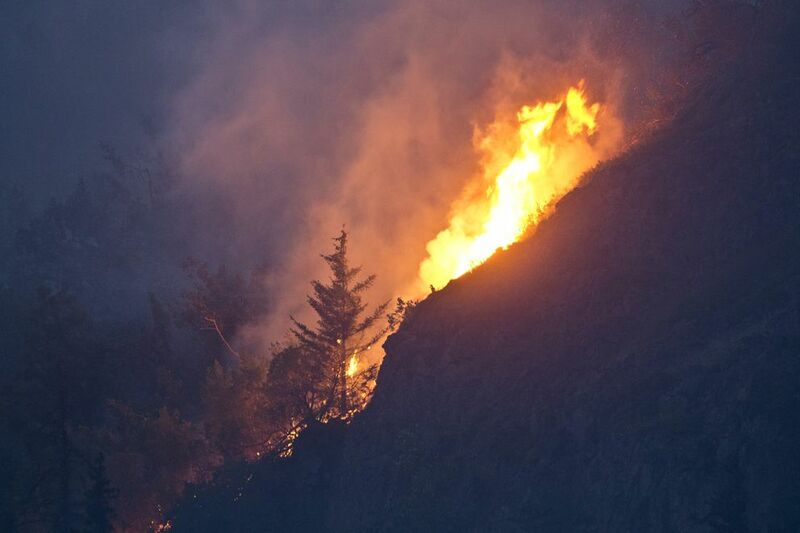 As fire crews battled the blaze in the mountains, on steep, difficult terrain, two-lane traffic flowed smoothly below Wednesday on the Seward Highway, after serious delays the day before. McHugh fire incident commander Tom Kurth said at a press conference Wednesday morning that the fire was concentrated in McHugh Valley with a "finger of fire" creeping southeast toward Rainbow Valley, where there are about 17 homes. Another leg of the fire moved slowly northwest overnight Tuesday, up McHugh Valley toward Potter Valley. "There's been minimal growth today," said Sarah Saarloos, a state Division of Forestry spokeswoman. 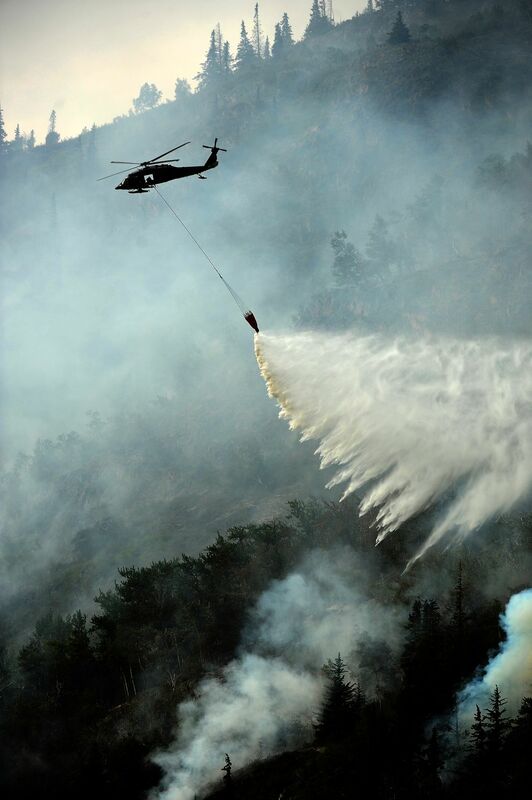 Saarloos said firefighters focused Wednesday on holding the northern perimeter of the fire, keeping the flames away from homes with the help of aircraft, including helicopters that hauled seawater from Turnagain Arm to dump on the fire. 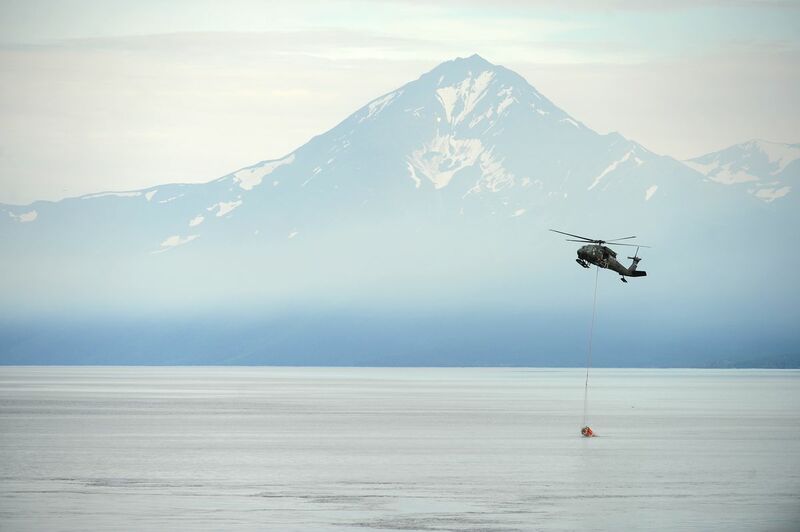 When the fire did spread Wednesday, it went toward the Seward Highway, Saarloos said, but crews were able to quickly control flare-ups. "So not a lot of movement today," she said. One wild-card factor going into Thursday was wind. For days, the wind has blown in from the northwest in hot and dry weather, sending flames and smoke southward. However, the National Weather Service said Wednesday winds were expected to shift to the southeast overnight, likely sending smoke into Anchorage. "Any sort of wind shift is always a concern," Saarloos said. "That's why we have an extra effort with the air resources." 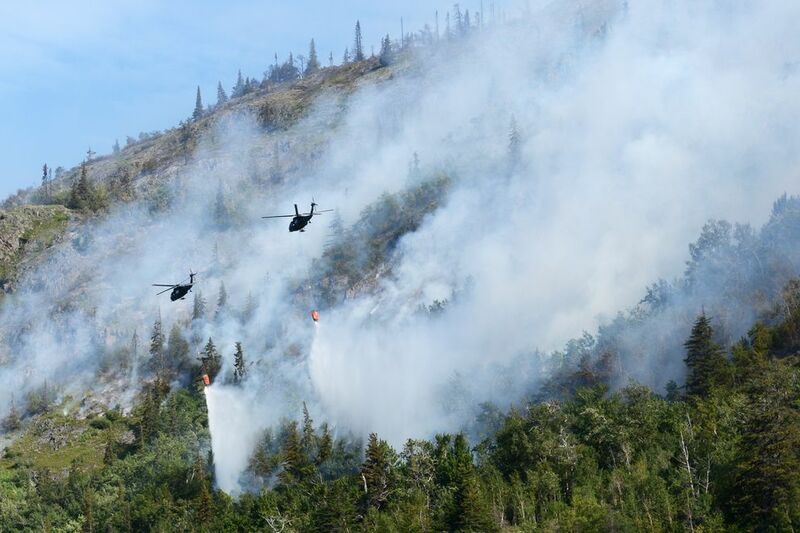 On Wednesday, roughly 150 firefighters, from smokejumpers to Joint Base Elmendorf-Richardson crews, were battling the blaze in what Kurth called "some of the toughest country you're going to find in Alaska to fight fire in." One hundred firefighters requested from five Hotshot crews from the Lower 48 arrived in Anchorage on Wednesday to join the fight against the blaze starting that night. Kurth said the cause of the fire was still under investigation Wednesday, but he suspected it was human-caused, because it's a popular recreation area. Fire officials were first alerted to the fire late Saturday. Four days later and the latest maps showed the fire was holding steady at about 1.3 miles from Rainbow Valley and 1.1 miles from Potter Valley. Several mountain ridges separated homes in both the Rainbow and Potter valleys from the flames, Kurth said. By late Wednesday afternoon, no evacuations had been ordered. Kurth described a "ready-set-go" communication formula. "Ready" means a threat is in the area. "Set" means the threat is increasing, and "go" means a threat is imminent, Kurth said. At this point, homeowners were advised to be in "ready" mode. 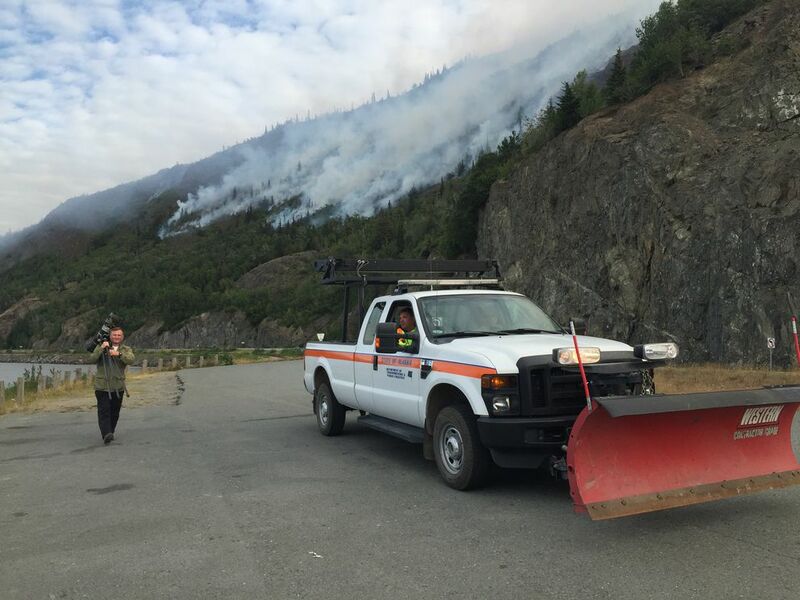 A Wednesday update on the fire from the official Alaska Wildland Fire Information blog said crews were assessing structures in Potter Valley and working to protect infrastructure along the Seward Highway, including power lines and the Alaska Railroad. Anchorage Fire Department Fire Marshal Cleo Hill said 13 AFD firefighters, operating two engines and two tenders as well as brush, medic and supervisor units, were on standby to conduct structure protection if called upon. Some Alaskans living on the Hillside, including Potter Valley, prepared Wednesday to leave their homes if the fire crossed a mountain ridge and spread into their neighborhood. Nancy Pease, former chair of the Rabbit Creek Community Council, said she and her son spent about four hours packing the family's truck this week with photographs, jewelry and important documents, like insurance forms, wills and passports, as well as computers. She also packed small family mementos, like a book from her great-grandmother, she said. This map shows the McHugh Creek wildfire burn area estimated at approximately 842 acres on Wednesday afternoon, July 20, 2016. "What one realizes is it's all stuff and a lot of it is expensive, it all adds up, but it could be replaced, like Xtratuf boots and so forth," Pease said. Kurth said while much larger fires are burning elsewhere in Alaska, the McHugh fire is unusual for its steep terrain, coastal environment and proximity to the Anchorage area and traffic. "This is 10 times harder country to fight in," Kurth said. Forestry Division spokesperson Tim Mowry said the fire's behavior early Wednesday repeated Tuesday's pattern. "It acted up this morning again, and it was doing the same thing it was doing yesterday morning — burning along the road, with debris coming down along the road," Mowry said. "The highway remains open." Pease said she's frustrated the neighborhood has not received more frequent fire updates, including the likelihood of an evacuation, and consistent information about how close flames were to the nearest structures. "Informing residents has been totally inadequate," said Pease, who lives on Villages Scenic Parkway, off winding Potter Valley Road. Pease said her neighbors' reactions to the fire varied. One rented a U-Haul and started loading up his valuables, while her other neighbor has not packed a thing. "I attribute that to a lack of information available," she said. Pease said she has lived in her Hillside home for more than a decade, and has always known the McHugh Creek area posed a threat, especially the heavily used picnic area. She described it as "the sword of Damocles, the danger lurking right over the hill." Anchorage police dispatchers advised drivers to "proceed with caution" on the Seward Highway on Wednesday. Highway webcams showed traffic flowing normally despite heavy smoke from the wildfire, though pullouts from McHugh Creek recreation area to Rainbow were blocked off to the public starting around 11 a.m.
Shannon McCarthy, state Department of Transportation and Public Facilities spokesperson, said the highway is expected to remain open throughout Wednesday. Flaggers are still staged near the fire in case authorities need to implement new lane restrictions or closure. Kurth said at the Wednesday morning briefing responders were counting on rain in their firefighting strategy, after Anchorage hit a record-high temperature of 79 degrees Tuesday, based on readings taken at Ted Stevens Anchorage International Airport. The weather service forecast for Turnagain Arm called for mostly cloudy conditions with a high of 72 degrees Wednesday, and a 30 percent chance of rain Wednesday evening. That rises to an 80 percent chance by Thursday evening. Christian Cassell, a National Weather Service meteorologist working on the incident management team, said there would likely be a "few spits of rain" on Thursday, with steady rain coming Friday. "We are at the end of this highly warm and dry pattern and we are going to transition to a much cooler and wetter pattern, for really the foreseeable future," Cassell said. "Tomorrow is going to be our transition day." Currently, fire officials are opting for a defensive strategy not focused on containment. "It is just wearing our fire crews out that are trying to go direct on the edge there," Kurth said. Officials would look at switching to more of an offensive attack with wetter weather and the additional reinforcements, he said. 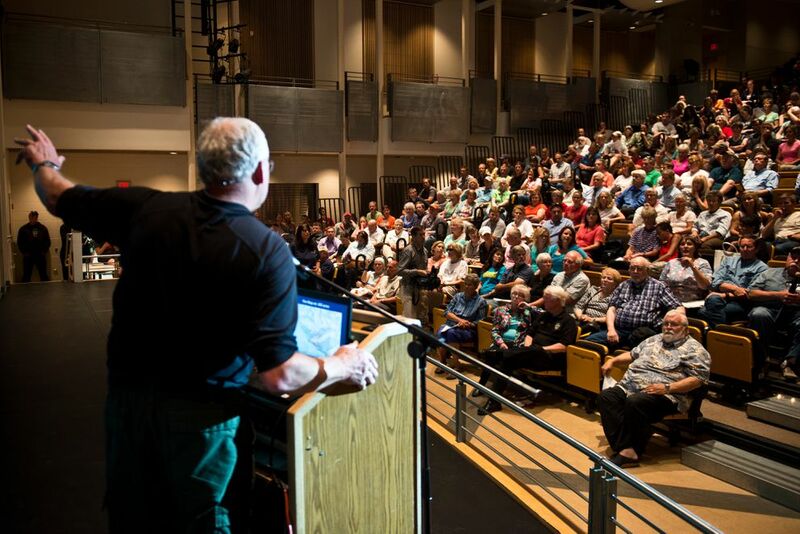 "Everything is looking pretty good for us, provided that the National Weather Service is correct," Kurth said during a community meeting at South Anchorage High School on Wednesday evening, where more than 100 people gathered to hear the latest on the fire. Bill Miller, Anchorage Police Department acting deputy chief, said that if Anchorage's Hillside neighborhood had to be evacuated, the Seward Highway would be closed in an attempt to reduce traffic. The first shelter opened would likely be at the Spenard Community Recreation Center, he said. Dan Williams lives in Mountainside Village and said he left the meeting with more knowledge about the "ready-set-go" communication formula and planned to go home to gather important documents. He said before the meeting he and his wife had already come up with a basic evacuation plan, discussing the things they hoped to take with them, like family heirlooms and art, "given time," said Williams, 43. "If there's no time and we have to move, then we're just going to go," he said. Fire officials declined donations offered by Alaskans to help fire crews, instead directing them to the Wildland Firefighter Foundation. The next community meeting is scheduled for 7 p.m. Friday at South Anchorage High School. For more information about the fire and highway closures, go to akfireinfo.com or call 907-343-4701. Devin Kelly contributed information to this story.